Cruise Line Tourism is an important and growing industry in Ireland. The larger the vessel, the greater the number of passengers that disembark to spend money. In recent years, Ireland's larger ports have been hosting turnarounds. Turnarounds see 3,500 passengers end a cruise in Cork, Dublin or Belfast, where they are replaced by another 3,500 passengers ready to set sail. Many of those who end their cruise holidays in Ireland travel around the country, before flying home. The cruise industry is worth €50 million to Irish tourism but an announcement by Dublin Port that it will reduce the number of passenger ships coming into the capital from 2021 has been met with concern. Last year 150 cruise ships called to Dublin port. This year that number will rise to over 160. But from 2021, only 80 ships will get access to berths. The Dublin Port Company says that is because cargo volumes are up by over a third since 2012, leading to tighter berthing space at the port. Dublin Port has said that due to the €1 billion cost of capital works from 2019 to 2028, it is necessary for the company to "introduce a system to better balance the allocation of berths for essential year-round cargo services and for seasonal cruise ships". Managing Director of Excursions Ireland and one of the founding members of Cruise Ireland Niamh McCarthy says she knew a decision was coming but did not think it would be so drastic. "The fact that they are curtailing the Port to two large ships a week and no turnarounds is astonishing to everyone involved in the industry", she says. She says it will have wider implications on the tourism industry here. 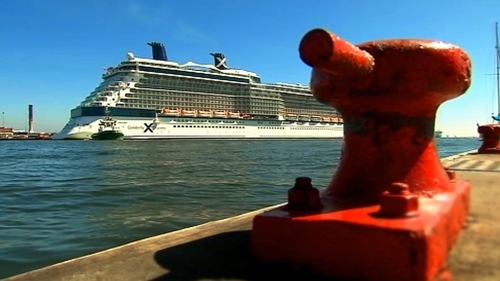 The world’s largest cruise industry trade association has also expressed disappointment. The Cruise Lines International Association says the decision by Dublin Port to move from highly-regulated port calls to an "extremely restrictive regime" from 2021 is worrying. It has been informed that for the summer season the Port will only allow two large cruise ships per week; one large ship per week in the winter; and zero turnarounds. In a statement it says the port had given valuable support in growing Ireland as a valued cruise destination for the international cruise industry. Dublin Port says that the new policy will see the same level of cruise ship activity in Dublin Port in 2010 and points out that since the 1980s, it has provided considerable financial support from its own resources to develop cruise tourism to the capital. Those reliant on the industry are in shock. The owner of Bartons Transport, Fergal Barton which services up to 150 ships between May and October in Dublin says operators that supply coaches around the country, guiding services, tourist destinations and visitor attractions will be affected. "On a good day you have 100-120 working directly with the cruise line services as well as people working in shops that the coach would go to", he says. To cater for large numbers of cruise ships in the future, Dublin Port says new berths have to be constructed at the North Wall Quay Extension in Dublin Port - adjacent to the Tom Clark Bridge. It has called for co-financing and/or long-term financial guarantees from cruise lines - a requirement which is set out in the Port’s Masterplan 2040. Niamh McCarthy acknowledges that a huge investment is required for designated cruise berths and that Dublin Port does not get the financial return on that investment. "I think it's important that the Government looks at it to see if we can get funding towards it or even get Dublin Port to come up with a different plan; something that will still make way for ships to come in and not have it all over the world that Dublin no longer wants to be a gateway for an international industry", she says. The irony that the decision was announced on a week that Government ministers were in far flung corners of the world, using St Patrick's Day to promote Ireland as a tourist destination, has not been lost. Cruise Lines International has urged Dublin Port to work with the Irish Government and the cruise industry to build cruise tourism sustainably across Ireland. A spokesperson for the Minister for Transport Tourism and Sport said Shane Ross will be meeting Dublin Port tomorrow and the issue will be on the agenda and his Departmental officials will be raising the subject with Fáilte Ireland. This week, Niamh McCarthy will travel to the US with representatives from Belfast and Cork ports to persuade cruise corporations not to remove Ireland from their future itineraries in favour of other world ports. "If they remove us from their itineraries from now, who knows when we will get them back. We may have lost them forever because it appears that we didn't want them in the first place," she says.